So we’re reaching the peak of the Festive Season here in India, or so it seems. It’s Diwali just now (aka Deepavali) — a national holiday. Probably the biggest festival for Hindus, and celebrated by Sikhs and Jains as well. 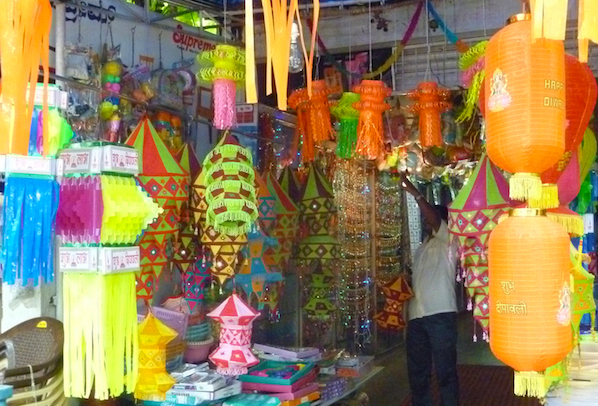 Buildings are festooned with rope-lights, fancy goods shops are bursting with lanterns, and street vendors are selling huge mounds of the tiny ceramic diyas (oil lamps) which are so symbolic of the festival, and which give it its name. Meanwhile, the large shopping malls seem intent on whipping consumers up into a shopping frenzy, pushing ads at them referring to the “festive season” — not unlike the crazy Christmas rush back home. Diwali is such a big event in the Indian diaspora that it was actually a major part of the calendar in Leicester when I lived there, and the constant sound of fireworks outside just now reminds me just what it used to be like when I lived there, although it’s significantly louder here! Back then, due to the timing, the fireworks would also seemlessly merge with Bonfire Night — November 5th — giving the impression of some kind of on-going street warfare that lasted a week or two. It seems like celebrations have been building for some time. 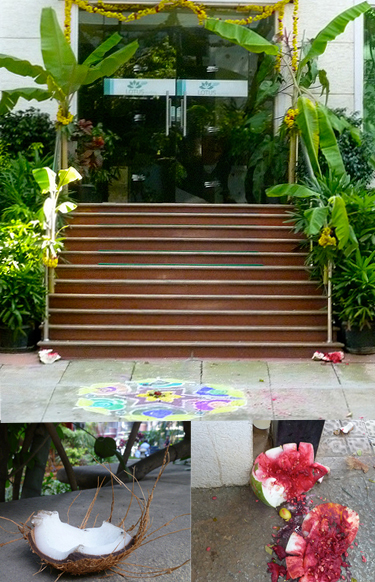 Back at the start of September we had Ganesh Chaturthi, followed by Dussehra a couple of weeks back. At that time I was in Mysore, with the aim of going to a smaller town to chill out for a long weekend during the 1-week break we have between terms. Big mistake! It turns out that Dussehra is the biggest event of the year in Mysore — the former Maharaja’s seat, and capital of the Kingdom of Mysore before it was subsumed by the state of Karnataka and overshadowed by Bangalore — and needless to say the place was absolutely mobbed. Still, it was interesting to be in a different place, and I took lots of pictures. One thing I love about all these celebrations is that there’s so much colour, vibrancy and symbolism absolutely everywhere you look, partly because religion plays such an important part in everyday life here. Each Hindu festival has associated Pujas which involve all kinds of symbolic rituals and prayers, usually involving lots of flowers, mango or banana leaves, fruit, vegetables, coloured pastes and powders, oils and incense… all of which seems to be played out in public, and even if you don’t see the puja in action, you certainly see or hear the evidence as you walk down the street. 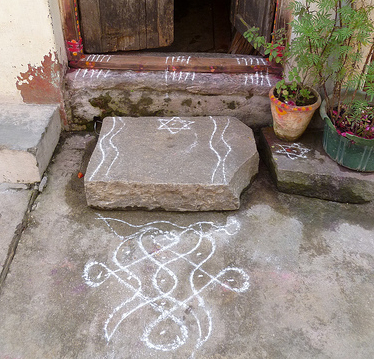 From the kolams on people’s doorsteps to the tell-tale marks on a car or a motorbike that show that it’s been recently blessed by a priest, or even just the tinkling of a prayer bell from a neighbour’s house, all of these signs and symbols are absolutely everywhere, and of course they seemed pretty mysterious and exotic at first. All this colour and spectacle and sunshine is addictive, or at least very welcome to those of us who come from gray, dour, rainy, Northern Europe. From discussions with work colleagues I think we would all miss this a great deal when (or if!) we finally return home. Anyway, Happy Diwali! शुभ दीपावली! And all the best for the forthcoming year!